Meet your new everyday essential - the Ambridge. 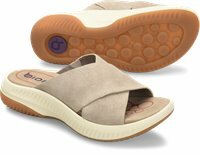 This ultra-versatile sandal brings you the sleek, smooth look of a cross-front slide with the comfort and durable grip of a walking shoe. It's the perfect slip-on-and-go sandal! This was my first pair of Bionica. I'm in love with this sandle. I immediately took out of box and wore for the next 8 hours. The quality and comfort is what I'm looking for and this delivered!!! I will defianetly buy this sandle in another color.